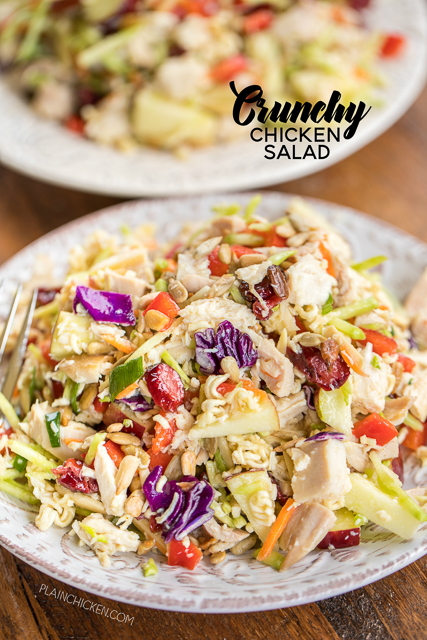 Crunchy Chicken Salad - seriously the best chicken salad EVER! SO different, but crazy good! Chicken, broccoli slaw, red apple, sunflower kernels, dried cranberries, green onions, red bell pepper, slivered almonds, ramen noodles, tossed in vegetable oil, vinegar, sugar and ramen seasoning. Can make ahead of time and refrigerate until ready to serve. Makes a ton - great for a party! When I told Chicken Legs about this Crunchy Chicken Salad recipe to say that he was less than thrilled would be an understatement. He said it was weird and didn't want to eat it. I just ignored him and made it anyway. Once I had everything mixed together, I had him come over for a quick sample. He reluctantly took a bite and said "That is really good!". LOL! 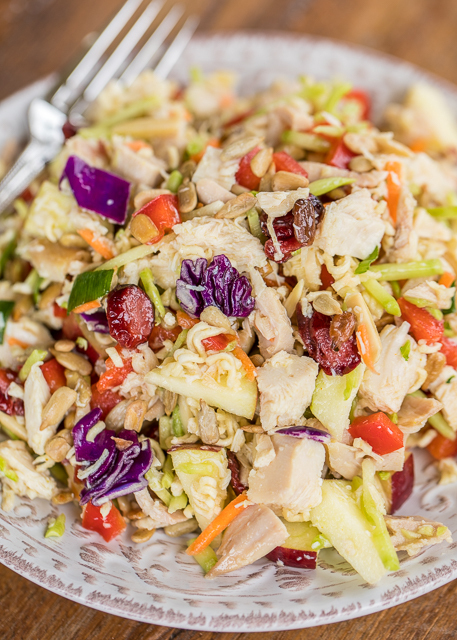 The base of this Crunchy Chicken Salad is a bag of broccoli slaw. 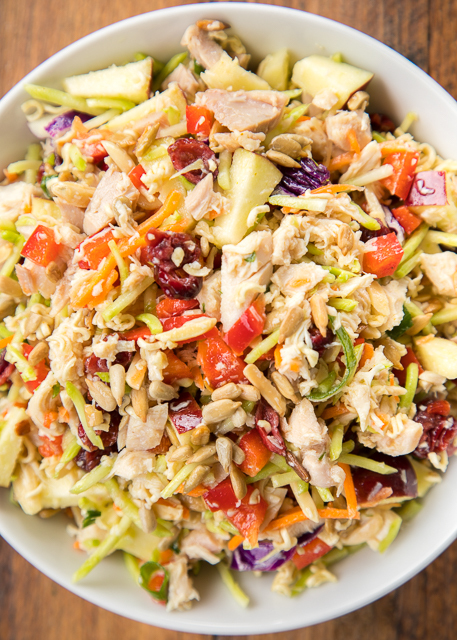 This was my first time using broccoli slaw, and I loved it! I found the broccoli slaw in the produce section near the other types of slaw. I couldn't find it at my grocery store, but Target carried the slaw in their produce section. This recipe makes a lot. It is perfect for a crowd. I think this would be perfect for a bridal or baby shower or even tailgating this fall. It also keeps well in the fridge for several days. I actually like to make a batch and divide it into plastic containers for an easy lunch all week. This recipe uses almonds and sunflower kernels. I bought both of the nuts at Trader Joe's. Nuts are SO stinkin expensive at my grocery store! They charge over $6 for a teeny tiny bag. Nope!The almonds and sunflower kernels are very reasonably priced at Trader Joe's. They are also pretty well priced at Fresh Market or Whole Foods. Whisk together the contents of the ramen seasoning packets, oil, vinegar and sugar. Set aside. 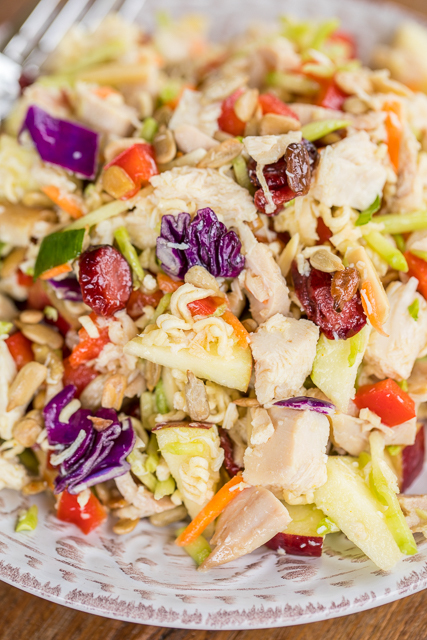 In a large bowl, combine the broccoli slaw, apple, sunflower kernels, dried cranberries, green onions, bell pepper, almonds and chicken. Add the dressing, toss to coat. Crush the uncooked ramen noodles and add to salad just before serving. Toss to coat. Can't wait to try this. Like the variety with the apples and cranberries. This was delicious. I did make a few modifications to the dressing: eliminated the seasoning packets from the ramen noodles and substituted 1 tsp of sesame oil; reduced the oil from 3\4 to 1\2 cup.